Two Lithuanian students are hard at work on special contact lenses designed to help glaucoma patients. Called NanoLens, these new contacts contain a glaucoma patient's daily medicinal requirements and can dissolve into a user's eyes immediately after application. The students behind this revolutionary NanoLens include Viktorija Pacharevaitė and Tomas Čaplinskas from Kaunas University of Technology (KTU). Pacharevaitė and Čaplinskas started working on the NanoLens as a part of their Technology Entrepreneurship course. Last year, Pacharevaitė and Čaplinskas entered their NanoLens into the Silicon Valley Innovation Challenge. Engineering students Paulius Kirkus and Darius Kairys of San José State University helped the Lithuanian team with their contact lens design. Out of almost 150 applications, NanoLens won second place in the Silicon Valley Innovation Challenge's "Best Global Innovation" category. The students believe this award will help their technology gain notoriety in the medical field. Professor Rita Juchnevičienė, who teaches at KTU's School of Economics and Business, traveled to California with Pacharevaitė and Čaplinskas. Dr. Juchnevičienė told reporters she was extremely proud of her students' performance and believes this award bodes well for the future of NanoLens. Glaucoma is one of the most common blinding eye conditions around the world. Current estimates show about 12.3 percent of the world's blindness cases are related to glaucoma. Due to the increasingly aging global population, current estimates suggest there will be at least 80 million people with some form of glaucoma by 2020. Although there are a few different forms of glaucoma, the most common is called open-angle glaucoma. All versions of glaucoma adversely affect a patient's retina. Unfortunately, a patient could have glaucoma in their eyes for years before the disease presents any visual symptoms. To keep tabs on this and other silent sight-robbing diseases, eye doctors recommend patients get a visual exam at least once every two years. While there's no cure for glaucoma, there are various treatments doctors can use to slow down the disease's progression. Typical treatment strategies include intraocular pressure (IOP) reducing drops like Latanoprost and laser eye surgery. Most patients with open-angle glaucoma have to take IOP reducing eye drops at least three times a day. 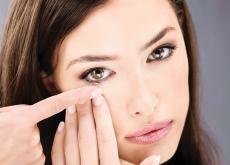 Pacharevaitė and Čaplinskas believe their contact lenses will only need to be placed in the eyes once per day. According to their research, medicine in dissolving contact lenses is better assimilated in the body than regular eye drops. On average, patients absorb five percent of their medicine from regular IOP eye drops. By contrast, recent studies show patients using dissolving contact lenses can absorb upwards of 30 percent of their medicine. There's no word yet on when NanoLenses will be available for sale. 2017's Silicon Valley Innovation Challenge was the 14th annual awards ceremony celebrating the latest advances in technology. Besides NanoLens, a few other big winners at this year's event include a food vendor program for hungry children called Gratis Food and a device to help paraplegics called Upright Assist. Founded in 1920, KTU is now one of the largest technical universities in the Baltics region. The city of Kaunas is located in the center of Lithuania, only an hour drive north of the Lithuanian capital Vilnius.